We are excited to announce the launch of new Fruit Chews from Stretch Island Fruit Co! "The Fruit chews come in three delicious flavors, Oh So Very Strawberry, Very Cherry and Razz-Mataz Raspberry. Made with 100 percent real fruit and natural ingredients, these better-for-you fruit snacks not only provide one full serving of fruit, but also contain no artificial sweeteners or preservatives. 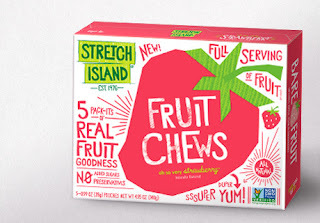 The new, individually-packaged fruit chews have been available in grocery and natural food stores nationwide since the beginning of February." What we thought: These deliciously, good-for-you treats will definitely be making an appearance in the kiddos baskets this Sunday:) They inhaled the samples we were sent for review and I know they will be thrilled to see them peeking out of the Easter grass! The great thing about these treats is that they are so good for you. 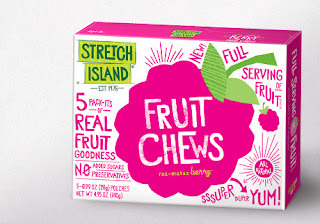 They aren't full of artificial sugars and fillers, but are instead made from real fruit...what a novel concept for a fruit chew:) They are a unique, refreshing addition to the fruit snack world! ABCD Diaries gives Stretch Island Fruit Co. Fruit Chews an A+! "Puppet Monsters are the adorable wearable stuffed toy with interchangeable parts!! Puppet Monsters have interchangeable eyes, ears, nose, horns, arms and much more! These loveable creative creatures love to share and swap their body parts! With just one Puppet Monster, you can create so many possibilities! Simply mix, match and attach the different parts! You can make a plush, make a hat or make a new friend! What kind of Puppet Monster and Monster Puppets will you create?" 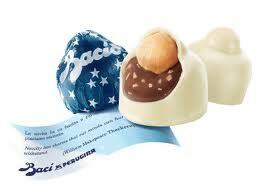 What we thought: Looking for a fun addition to those Easter baskets? Puppet Monsters are sure to bring smiles to the faces of your little ones. Our kiddos have really enjoyed dressing their monster up and taking turns trying to "scare" one another:) The pieces are easy enough for our 4 and 6 year olds to manipulate and I love that the monster itself is a storage container for all of the smaller pieces. ABCD Diaries gives Puppet Monsters an A+! Use promo code PUPPET at check out for an extra $5 off! "PretzelDogs are bite-sized hot dogs bundled up in a toasty pretzel crust - from the maker of America's #1 selling soft pretzel, SUPERPRETZEL! PretzelDogs are made with a unique soft pretzel dough and are available in two varieties: Original and Cheddar Cheese. · They are made with the highest quality ingredients, including top quality beef with no by-product. · Perfect minimeals, anytime snacks, or appetizers. · Each box contains 12 PretzelDogs." What we thought: The entire family fell in love with these bite-size snacks at first taste:) We love SUPERPRETZEL products and they've outdone themselves with PretzelDogs! Our new favorite pretzel snack:) These delicious little treats would make the perfect addition to your March Madness viewing parties or a tasty afternoon snack for the kiddos. ABCD Diaries give PretzelDogs an A+! "Get ready for a blast from the past with MIKE AND IKE® Retro Flavors, CHERRI AND BUBB, and LEM AND MEL. The Cherry-Bubblegum and Lemon-Watermelon flavors are hitting the shelves for a limited time only; from now-April. First debuting in 1989 and 1991, the unique and sweet flavor combinations are sure to be a hit!" What we thought: We really enjoyed these blast from the past flavors:) It was the first time the kiddos had ever tasted them and they were definitely a hit! The retro Mike and Ike flavors would make a great addition to any Easter basket! ABCD Diaries gives them an A+!